WTF President Chungwon Choue (left ) poses with Indonesian President Susilo Bambang Yudhoyono after conferring an honorary WTF Dan certificate on the Indonesian president in a ceremony at the Peace Hall in Kyung Hee University in Seoul on July 25, 2007. WTF President Chungwon Choue conferred an honorary WTF Dan certificate on Indonesian President Dr. Susilo Bambang Yudhoyono in a ceremony in Seoul on July 25, 2007. President Yudhoyono, who arrived in Seoul on July 23 as a state guest, also received a taekwondo uniform and black belt at the Peace Hall of Kyung Hee University. President Yudhoyono and First Lady Ani Yudhoyono, along with members of the official Indonesian delegation, watched a taekwondo demonstration by taekwondo students of Kyung Hee University. Kyung Hee established a four-year taekwondo department in 1983, the first of its kind in the world. Among the Indonesian VIPs attending the ceremony were Indonesian Minister of Sports and Youth Mr. Adhyaksa Dault; Mme. Rita Subowo, new member of the International Olympic Committee and president of the Indonesian Olympic Committee; and Lt. Gen. Erwin Sudjono, new president of the Indonesian Taekwondo Association. 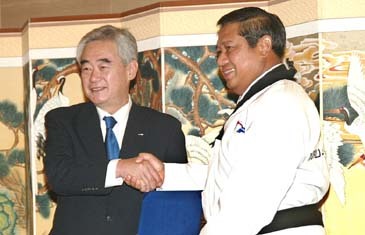 WTF President Chungwon Choue (left in suit) poses with Indonesian President Susilo Bambang Yudhoyono, together with memebers of the Kyung Hee University taekwondo demonstration team, at the lobby of the Peace Hall in Kyung Hee University in Seoul on July 25, 2007. "On behalf of the global taekwondo family, I would like to extend my congratulations to Your Excellency on becoming a member of the WTF's global taekwondo family, as you have just received an honorary taekwondo Dan certificate," said WTF President Choue in his welcoming speech. Dr. Choue continued that "On the occasion of your visit to Korea, it is my firm belief that Indonesia and Korea would further activate their material and personnel exchanges in various sectors, especially in the sports field through taekwondo." "I have heard that Your Excellency is talented both in sports and music, and hope that you will have a good impression of taekwondo," he said. "Your great concern and support for taekwondo would greatly help promote the Olympic sport of taekwondo in Indonesia, thereby raising your country's status in the international sports community." Dr. Choue said, "It is my convinction that Indonesia has great potential for further development of taekwondo, as it has hundreds of thousands of taekwondo practitioners, with its popularity rapidly growing." Responding to Dr. Choue's speech, Indonesian President Yudhoyono said in his remarks, "I know taekwondo is one of the best of Korean heritages to the world. I know taekwondo spreads not only a systematic technique of martial art, but also the spirit of inducing peace to the universal welfare of humankind." "I am now proud to be associated with the noble spirit of taekwondo." "I believe the conferring of this highest belt of taekwondo would cement strong relations and cooperation between the Indonesian Taekwondo Association and the World Taekwondo Federation," the Indonesian President said. "Moreover, I believe that through taekwondo we can bring closer people-to-people link between the two nations. I appreciate Korea's support for the establishment of the Sports Center of Korea-Indonesia Friendship (Taekwondo Center) in Cibubur, Indonesia." The President continued, "Taekwondo has been a popular sport in Indonesia for more than 30 years. There are now about 600,000 taekwondo enthusiasts across the country. We have taekwondo organizations at the national level as well as the provincial level. Taekwondo has also been officially played at Indonesian Sports Week, which is the annual national sports tournament in Indonesia, since 1985." "It is my fervent hope that the highest belt which I receive today will forever motivate Indonesian taekwondo athletes to better and improve their achievements in the future, in particular for Indonesian taekwondo athletes who are going to take intensive training in Korea for the Southeast Asian Games 2007 in Bangkok in December this year," the president said.